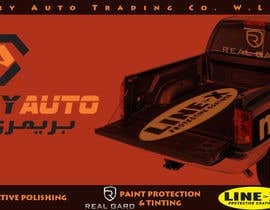 Design a Banner for Primary Auto Trading WLL. Co.
BOARD MUST DEPICT WHAT WE DO!!!!! 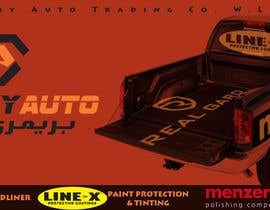 LINE X Protective Coating, Menzerna Professional Polishing, Real Gard Window Tinting and Paint Protection Film. I have a 10m by 4m Sign Board I wish to design something aesthetically pleasing, yet functional. The Board needs to mention the Logos attached and It needs to tell passerby what we do. The most trickiest is Line X IMO, as the brand is not famous in my country but I wish to make it so. The Company Logo needs to be on the Top. The Sign Board is made of Aluminium Panels and is Orange. I have attached a the file of what I am thinking but I don't like it, I need a artistic touch to tell a what we do, Just Putting up Logo's doesn't tell what we do. This is for a Shop Sign Board, not a Bill Board. Added Picture of Actual Shop, The ALUMAX are protective stickers until I add Lettering or Pictures. but the Orange is background. Please don't change the logo colors, you may add white outline or any other color. HI, can you please extend by a day? i would like to take part. Feedback for #19 , simplified version. Check simplified version under #19 , also nave left note in pm. ?ello sir,please check #11 #12 #13 #14 #15 #16,thanks! So far the Entries are not what I want, I added a picture of My Shop and I hope it will give you an Idea of What I am trying to say.